and 8 attack Squadrons equipped with Lockheed/Canadair CF-104 in Germany. A new fighter had to be selected to replace at least a part of these aircrafts which were quite expensive to operate. In 1964 a wide range of aircrafts were evaluated to replace both the CF-101 and the CF-104. The Ministry of National Defence had a strong preference for the Mc Donnel F-4 both in the General Electric J-79 or the Rolls Royce Spey engines equipped versions, in view of its all-weather capability and the foreseen deployment to Central Europe to support NATO in case of an aggression from the Warsaw Pact countries. The F-4 was rejected by the government due to costs consideration and the requirement was changed to a light attack aircraft, reducing the choice to the Douglas A-4E Skyhawk, Grumman A-6A Intruder, LTV A-7A Corsair and the Northrop F-5A Freedom Fighter. A two-seat version of the selected aircraft was also to be bought. Northrop F-5A serial 38421, marked already as CF-5, and F-5B 38445 came ca November 1965 to Canada for a demonstration. Canadair at Cartierville (near Montreal), while the engines were to be built by Orenda Ltd.
Centra European front to the Northern flank, which was less critical and where Norway operated a similar aircraft. CL-219-1A-17; Canadian Forces: CF-5 and CF-5D respectively for the single- and the double-seaters. Canadair built 50 reconnaissance noses. Serials were given starting with 14701.
of modifications as earlier experienced with long time stored aircrafts. 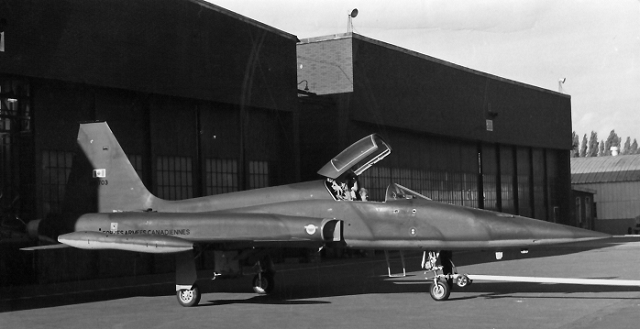 Roll-out of first aircraft, CF-5A serialled 14701, was at Cartierville on 06-02-68, five months late of original plans. Roll-out of the third built single seater at Cartierville on 06-02-68. This was the first to fly from Cartierville. This was the only confirmed CF-5 serialled in this sequence, as on 01-02-68 Canada's Army, Navy and Air Force were united into a single force as the Canadian Armed Forces/Armeés Canadiennes and the single-seaters obtained serials starting from 116701, the two-seaters from 116801. First flight of Canadian built F-5s (on 06-05-68, CF-5A now serialled 116701) and flight testing of the first and second production examples (serial 116702 rolled out at Cartierville May 6, 1968) took place at the main USAF test base, Edwards AFB in California, having been flown over by Canadian C-130Es; CF-5A 116701 was officially handed over to the Mobile Command on 05-11-68, but lost on 03-12-69 at Edwards during tests; it was replaced by CF-5 116702. The third example built and first two-seater, CF-5D 116801, flew for the first time on 28-08-68 at Cartierville. Production at Canadair proceeded; 10 CF-5s were in Air Force use on 31-12-68, by beginning of March 1969 15 CF-5As had been completed, 47 CF-5s beginning of April 1970, production tempo working up at 7 aircrafts per month, delivery to operational units having started in January 1969, pilots initially going to Williams AFB in Arizona for training with 425 Squadron (USAF) while their planes were being built. The first squadron to form was No. 434 "Bluenose" in 1968, the first CF-116D (116802) was flown to 434 Squadron at Cold Lake on November 5, 1968. The second squadron (No. 433 "Porcupine") formed at Cold Lake shortly thereafter. It was formed on August 25, 1969. As the 1968 defence budget restrictions imposed a reduction to only two deployable operational Squadrons and a training unit it was realised that the number of aircrafts available was over the actual need of single-seaters. The request to purchase 16 CF-5A and 4 CF-5D by the Venezuelan goverment came most welcome. In 1972 16 unused single-seaters (inclusive the last Canadair built) and 4 two-seaters (2 having been built especially for this country) were transferred to the Venezuelan AF, starting a dispute with Northrop regarding royalties to be paid, settled only in 1976 with the payment of USD 9 millions. As a compensation for the loss of the aircrafts transferred to Venezuela, 18 new CF-5D were ordered for the Canadian Air Command, the last first flown on 22-11-74 and delivered to CFB Cold Lake on 31-01-75. Canadian Forces took delivery of altogether 115 CF-5A/Ds between November 5, 1968 and September 21, 1971, 54 being on this last date operational with 433 and 434 Squadrons, each having between 2 and 4 CF-5D two-seaters for pilot proficiency check; 44 CF-5s were in storage at CFB North Bay and Trenton. in-flight refuelled by 2 second-hand B.707/CC-137 as the originally foreseen Lockheed C-141 in tanker configuration was not built. The year 1975 saw another round of Defence budget savings resulting in the decision to reduce the strength of the two operational Squadrons from 27 to 20 aircrafts, the surplus aircrafts joining those already in storage. Twelve additional CF-5A equipped No. 1 Flying Training School, while 6 had been lost in accidents. By mid 1977 the statistic showed 73 CF-5A/CF-5D in use, 31 in storage, 11 lost in accidents; during the early '80 there were 28 aircrafts stored in a hangar at CFB Trenton, see photo below. Bad news was the appearance of mainspar fatigue cracks in 1986, seriously affecting the fleet; after initial grounding for inspection and modification apparently only 29 operational aircrafts were left, 10 of these being in use by 434, 17 by 419 Squadron, 2 by the AETE. Following these unexpected airframe problems engineering studies for the modification of existing CF-5As and CF-5Ds were launched, completed at the beginning of 1987. The aim was to provide an aircraft capable of bridging the performance gap between the Canadair CL-41 Tutor and the CF-18. The studies recommended complete rewiring of the aircraft plus various airframe parts/wings replacement/strengthening; installation of a HUD display, a weapons aiming and computing system, a digital air data computer, an inertial navigation system was also suggested because some of the existing exuipment was no longer supportable and to make the aircraft more suitable to transitioning a pilot into the new McConnel Douglas CF-18. Initial contract, for the estimated cost of CAD 100 millions, was awarded in November 1988 to Bristol Aerospace to remanufacture 23 CF-5A and 33 CF-5D airframes, to be executed at the company's Winnipeg, scheduled delivery to be one aircraft per month until completion in 1994. The remaining 36 non-upgraded aircrafts were to be retired from service. In a separate programme, tests started in Februar 1989 and to be completed by 29-03-91, an unmodified CF-5 (116729) was to be tested to complete 24'000 simulated flight hours, test aimed at proving a 2'000 hour increase in the CF-5's service life, leading to the (modified) aircraft being cleared to 8'000 hours. First reworked prototype CF-5D, serial 116841, was rolled out at Winnipeg in August 1989. 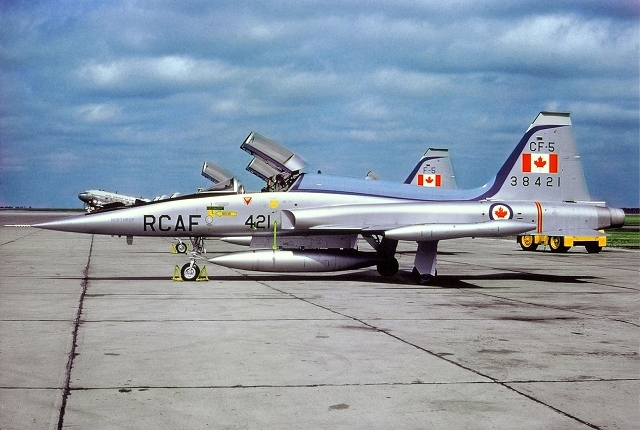 In the meantime 434 Squadron had been disbanded on June 01,1988 due to defence spending cuts resulting from the reduced 1988 federal budget and 434 Squadron had started conversion to the McDonnel CF-18 at the beginning of 1988; CF-5s were now only needed for the training task and the number of aircrafts to be converted was reduced to 46. A contract to upgrade the avionics suite of 46 CF-5s, worth CAD 70 millions, was granted to Bristol Aerospace during November 1990. This programme also covered the setting up of a new software database, training simulator and test and evalaution equipment. The entire two-phase (airframe/avionics) was planned for completion by 1995. Testbed for the avionics modification was the cockpit of CF-5D 116804, aircraft damaged on 03-03-69; two prototype single-/two-seaters were to be used for trials. Avionics updated prototype CF-5D flew for the first time on 14-06-91, at Cold Lake. The 1994 annunced Defence Policy White Paper budget cuts meant the retirement of Canadair CF-5s fleet, though the estimated life expectancy was to the year 2000. Student pilots had to proceed directly from the Canadair CL-41 Tutor to the, quite higher performing, McDonnel Douglas CF-18. Upgrading was reduced from 46 to the 36 aircrafts, those that Bristol Aerospace had completed at the time. No. 419 Squadron's 25 updated CF-5s left Cold Lake between mid and end of March 31st, 1995 to fly for storage at CFB Trenton; AETE at Cold Lakehad already transferred there Trenton the prototypes of the single- and double-seaters but continued testing the upgraded CF-5s unil the end of 1995, these proceding then to CFB Trenton for storage and resale. This marked the final phase of CF-5's use by the Canadian Forces, spanning some twenty-seven years and closed a significant chapter in Air Force fighter history. Last upgraded CF-5 was flown directly from Bristol Aerospace plant at Winnipeg to storage at CFB Trenton by 419 Squadron and AETE pilots on December 1995, never having been used by the Air Force. Two CF-5Ds, serials 116833 and 116839, were kept in a flying status with Bristol Aerospace for test and demonstration purposes to possible buyers. Bristol Aerospace could already announce on 04-06-96 the sale of 10 upgraded CF-5A and 3 upgraded CF-5D to Botswana, first three to be delivered in September 1996. There were even negotiations in 1998 with the US Navy for the lease of between 14 and 16 CF-5A/D to augment the US Navy adversary aircrafts. The fighters were to be provided free, with Bristol Aerospace being paid to maintain them during the lease period, which could have run for between three and seven years. Discussions were also held with several other countries, including Greece in 2001 (28 F-5s, cost USD 75m), the Philippines South Korea and Thailand, for the remaining 47 aircrafts. The Philippine, if realized, was to be rather a special sale, as it was foreseen to barter the aircrafts against raw material. Sales did not materialize; only three additional single-seaters Canadair CF-5A and two two-seaters Canadair CF-5D were sold and delivered to Botswana in the year 2000. Hope for additional sales was given up by the end of 2006, when the aircrafts were withdrawn from sale, having generated revenues exceeding CAD 120,000,000. In the meantime the airframes had been mainly transferred from CFB Trenton to CFB Mountain View, some also having been handed over to museums and others kept for preservation or instructional purpose at various Canadian bases. See CF-A and CF-5D serials lists for details. Civilian company Tactical Air defense Services announced in September 2010 that it had acquired 6 Canadian CF-5s plus 45 General Electric J-85-15 engines for USD 6m from Crown Asset Distribution; six additional CF-5D were registered to Global Aviation International from Jupiter (FL) on 15/16/17 Junly 2013. All stored aircrafts have now left CFB Mountain View.